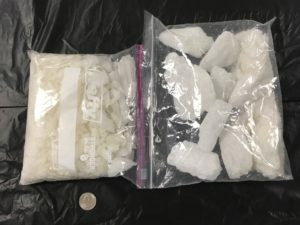 Oshtemo Township, MI: On the morning of 11/1/16, Investigators from the Kalamazoo Valley Enforcement Team received a tip that a male was transporting a large amount of Methamphetamine “Ice” into Kalamazoo from Arizona. KVET Investigators conducted an investigation that led to a search warrant on the suspect’s motel room. During the search, approximately two pounds of methamphetamine “ice” was seized from the suspect’s luggage. The suspect, 48 year old Arizona man, was arrested and lodged at the Kalamazoo County Jail for possession with intent to deliver methamphetamine.